A freshly debuted $200 toothbrush that promises to both brush and floss your teeth is heating up bathrooms for all the wrong reasons. This month, the electric toothbrush and water flosser company Water Pik announced a voluntary recall of all units of its Sonic-Fusion toothbrushes over claims that some of the products have shot off sparks and partially melted while being charged. In at least one case, the toothbrush caused a fire. 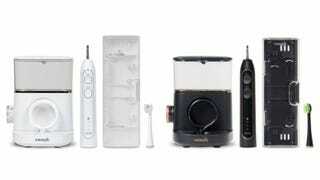 According to the announcement, also distributed by the Food and Drug Administration, customers have complained of toothbrushes that are overheating when placed in the charging base, leading to “localized melting and sparking.” There have been four reports of overheating and one report of a small fire caused by the products, all in the US, a Water Pik spokesperson told Gizmodo. At this point, there have been no reports of injury. The recall concerns 3,800 units of Sonic-Fusion toothbrushes that were distributed between June 2017 and June 2018 across the US and Canada. A list of the affected model and serial numbers can be found here. “Consumers who have the affected units should stop using them, immediately unplug the unit, and return them to Water Pik, Inc,” the company’s statement read. It’s a poor start for Water Pik’s new product, which it touted as the first toothbrush to receive a seal of approval from the American Dental Association as a dual electric brush and water flosser. The product functions as a electric toothbrush, but has a nozzle in the middle that acts as a water flosser (please enjoy its deliciously campy infomercial here). In a departure from the typical recall, the takeback mostly doesn’t affect the paying public. The recalled products were given to “professional educators” and “key opinion leaders” or sold through trade shows and for a limited time online. And the toothbrush only became widely available to the public this May. Sales of the Sonic-Fusion have since been indefinitely suspended until the problem can be fixed. It’s not the first recall from Water Pik. In 2012, the company recalled its SinuSense Water Pulsator nasal irrigation device because water kept getting into the product’s battery compartment, which could ruin them. The company does not have a timeline on when its current investigation of the faulty toothbrush might be wrapped up, Water Pik said. What&apos;s With All The Dental Floss in IBM&apos;s Quantum Computers?